. . . are an interesting addition to our collection of animals. These guys, pictured here in their temporary home, at about four weeks old, are little fuzz-balls with stubby little wings. They are much too young to be turned loose in the garden. Their temporary home is a portable kennel that was previously used by a 140-pound rottweiler named Hildagard (as in Hilda, guard dog). Sadly, Hilda is no longer with us – she lived to a ripe old age, and her ashes are now enriching the soil in a rose garden. Be that as it may, we plan to enclose a small part of the garden behind the house so that the ducklings can “run wild” for short periods of time under close supervision. Once they are full-grown, they can have part of the garden as their very own with little or no supervision. Their names? Dixie and Louis. It is rather difficult to tell which is which at this point in their development. 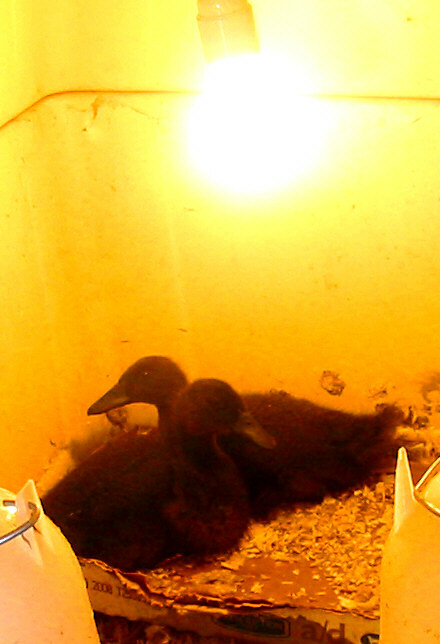 This entry was posted in Pets and tagged cayuga ducks, ducklings. Bookmark the permalink.